The Duchy of Lancaster is to open the doors of Lancaster Castle to Alice and a range of characters from Lewis Carroll’s much-loved children’s classic this August Bank Holiday weekend. Devised and animated by local immersive theatre company Step into the Story, the three-day event will include themed activities and character-led performances throughout the Castle courtyards, providing an interactive theatre event for the whole family. The two-hour experience opens with a stage show where visitors are reintroduced to the most famous characters in Wonderland. Children are then divided into groups and taken around the Castle courtyards to participate in interactive activities. 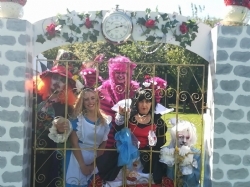 They will have an opportunity to take part in the Mad Hatters tea party, play croquet with the Queen of Hearts, enjoy creative arts and crafts with the Cheshire Cat and disappear down the rabbit-hole to hear the White Rabbit telling stories of Wonderland. Parents may of course attend but only if accompanied by children! At the end of the two-hour experience, children also receive a goodie bag of souvenirs to take home with them, together with their memories of the day. Carol Little and Linda Hampton are the creative team behind Step into the Story, a theatre and events company which is building a reputation for similar events throughout the North West. Linda is the script writer, director and one of the performers; in this show she plays the Queen of Hearts. Carol is the designer and producer, as well as the creator of the brightly coloured sets and props which set the stage for the theatrical performances. Please note: this is a ticketed event and numbers are restricted, so advance bookings are highly recommended. Performance times for the Saturday and Sunday are: 10.00 am to midday, 1pm to 3pm and 4pm to 6pm. On Bank Holiday Monday the last event will finish at 4pm. Prices are £15 per child (includes one accompanying adult), with a £3 surcharge for each additional accompanying adult.